This photo by William Corbett shows a V&T excursion train at Minden. This excursion was held Memorial Day weekend 1949 to raise money and awareness for the struggling railroad. In this photo you can see Combination Car #18 in the middle of the train, as it is turned around on the Minden wye. Several passengers have stayed on board and are peeking out the windows. The boy on the platform is Hart Corbett, William's son. Car #18 is currently at the Nevada State Railroad Museum, but all that's left of it is a charred shell. Arsonists burned it in 1961. 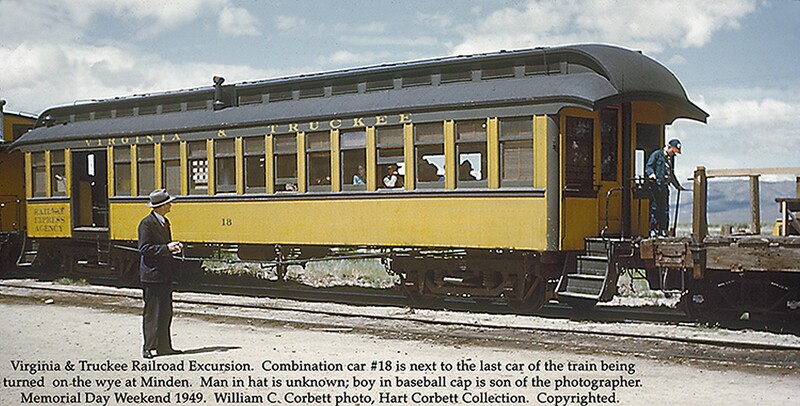 Source Caption: Virginia & Truckee Railroad Excursion. Combination car #18 is next to the last car of the train being turned on the wye at Minden. Man in hat is unknown; boy in baseball cap is son of the photographer. Memorial Day Weekend 1949. William C. Corbett photo, Hart Corbett Collection. Copyrighted.